In order to complete a successful floor installation with good performance, it is essential for the General Contractor constructor to coordinate a number of different trade service providers and materials suppliers successfully. There are many divisions of responsibility in concrete floor construction and poor communication between these project participants can lead to reductions in quality and lower performance. A complete understanding of roles and responsibilities is essential in order to achieve optimal results and this is the ultimate purpose of the Concrete Floor pre-construction meeting. It is essential that the following parties participate in Concrete Floor pre-construction Meeting: the General Contractor constructor, an owners representative (architect or engineer), the concrete floor contractor, the ready mixed concrete materials producer and the inspection and testing company. Other participants may include: earthwork trade contractor, major materials suppliers, safety representatives (anyone with an interest in improving safety & quality). 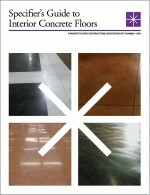 Each element of the floor installation must be reviewed carefully based upon specified requirements including conformances to building code standards, concrete supply responsibilities, reinforcing, floor jointing, concrete placing & finishing methodology, floor sealing / applied finishes, joint filling & floor protection. Critical parts of this process include materials submittals and a floor joint shop drawing (or jointing recommendations). The materials submittal should list all the materials to be incorporated into the concrete floor (including the concrete mix). The floor joint shop drawing should review contraction and construction joint locations and spacing considerations. Pre-construction meetings must be held a minimum of 4 weeks ahead of concrete placement in order to allow sufficient time for minutes to be issued, any necessary submittals to be made, approvals to be received and sufficient time to make any necessary changes before commencing work. The pre-construction meeting is a critical step in achieving the highest quality and CFCA members are committed to this critical planning on every project they undertake. The CFCA is a not-for-profit voluntary membership association of quality oriented concrete floor contractors and materials suppliers. Please consider pre-qualifying “members of the Concrete Floor Contractors Association” on your next project to help support continuing efforts to promote safety, quality and integrity in the concrete floor industry.